Attractive antique Victorian mahogany dressing mirror. 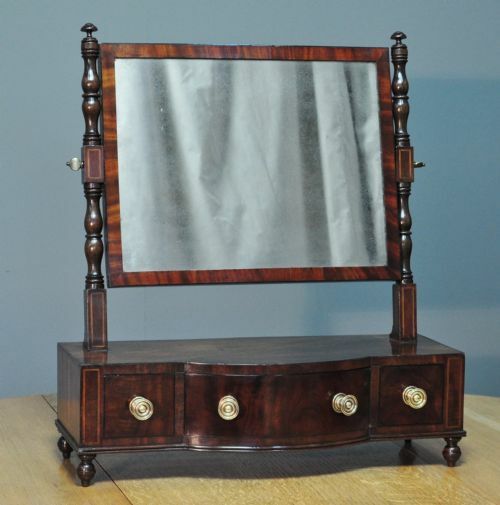 A lovely early Victorian mahogany mirror. We date this mirror to the first half of the 19th century. The mirror consists of an oblong shaped mirror, supported on an attractive frame. The frame sits on four small turned legs. The turned mirror supports rise from the drawer base to support the mirror at either side. The mirror supports have attractive finial tops. The base has an attractive bow front design and features three drawers, the drawers are fitted with brass circular handles. There is a small amount of inlay around the frame. The mirror glass is showing a little misting due to its age but is still in a good usable condition. The mirror has an overall height of 28" (71cm), a width of 24.5" (62cm) and a depth of 10.5" (27cm). This lovely antique mirror remains in very good solid condition with only very minor surface markings commensurate with age and usage. There are some minor indentations to the finish from past use, primarily around some of the edges. This remains a very stylish and elegant antique mirror which will continue to provide good service for many years to come.